One of the best things about India and the thing I miss the most food-wise is street food. Here’s one of my favorites, the bombay sandwich. A simple yet soul satisfyingly delicious snack perfect for an appetizer or served with coffee or tea. The thing I love about this is you can make this with things you probably always have in your pantry. The only extra step is to make the chutney which is the star of this dish. 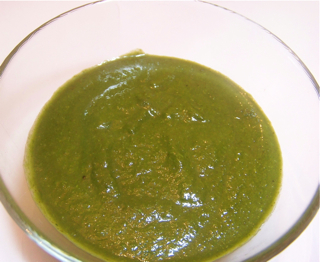 Blend all the chutney ingredients together in a blender with as little water as possible. You want a smooth texture almost the consistency of room temperature butter. Fill a pot of cold water an add some salt. Drop in the potatoes and bring to a boil. Boil until the potatoes are completely cooked. Peel and slice into thin rounds and set aside. Remove the crusts off the bread, slice the onions and tomatoes and set aside. Spread the chutney liberally on the first slice of bread. Place a couple of the sliced onions and tomatoes on it. Add a pinch of salt and pepper. Spread the chutney liberally on the second slice of bread and place it on the first slice with veggies, chutney side up. Place the sliced boiled potatoes on the second bread, add a pinch of salt and pepper. Spread the third slice with chutney and place on top of the potatoes chutney side down. Press down slightly. Cut into four pieces serve at room temperature.